When my daughter was in third grade (I can’t believe how long ago that was…), I was asked to bring apples and caramel dip to their Halloween party. I bought the stuff from the store because I thought you couldn’t make anything for schools (we were new, I guess it’s not such a big deal in rural schools- there were homemade pies!) and I couldn’t believe how disgusting it was. Sorry to those of you who like it! But there’s really a weird aftertaste, and of course that long list of ingredients (not many of which I recognized as food…). 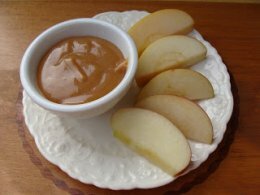 But I wanted to be able to have some with all the great apples that were becoming easier to get, so I searched for a caramel dip I could make that would taste great. After a couple of tries (too runny, too sticky, cream cheese?) I found the perfect one in one of those booklets/cookbooks put out by a church (or something-I can’t remember now). OK, it was almost perfect- it called for corn syrup and I don’t buy that- but honey worked just as well (or should I say better?). You are not going to believe how good it is – and super easy to boot! Isn’t that a great picture? Four ingredients, nothing weird. Back when I started the cursed “reading of the labels” and found I had to stop buying a lot of things we liked, I was pleasantly surprised to find that sweetened condensed milk is just whole milk and sugar. For me that works. 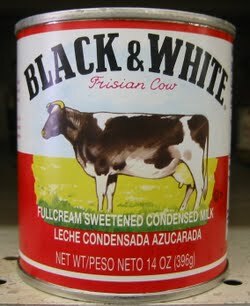 For those of you that are not wanting to buy any convenience foods there is a recipe for making your own sweetened condensed milk here which I’ve done in the past and found it worked well. Also, did you know that not all brown sugar is created equal? I’ve read numerous times that all brown sugar is “just white sugar with molasses added, ” and while that’s true of the cheap store brands, C&H is pure brown sugar with no molasses added (this is directly from their website– the brown comes from the NATURALLY occurring molasses that forms during the cane sugar refining process, it’s not added after like beet sugars). There was a comparison done in the Oregonian years ago that showed differences in baking the same products with cane sugar vs. beet sugar, and since then I’ve always bought cane sugar. Start by melting one stick of butter over medium-low heat in a heavy saucepan, then add one cup of brown sugar, 1/2 cup honey, and the can of sweetened condensed milk. Note: this takes a few minutes, and sometimes I get a few flecks of brown from the bottom when I’m not careful (actually, only when I’m distracted *smile*), but it’s not a burned flavor and still tastes good. Remove from heat and let cool a bit before pouring into a serving bowl. Serve warm. Keeps for awhile (not in our house!) in the fridge- you just need to microwave it for a few seconds to soften before using. Now here’s the tradition that developed at our house after finding this recipe. Every fall we have an apple tasting dessert. We’ve done it with guests, too, and it’s really fun for a group. I buy four or five different apples (this year it was Pinova, Cameo, Pink Lady, and a “no-name” apple from our neighbor’s tree), put them out on individual plates, and write the name of the apple on a piece of paper to set on the plate. While this sounds all Martha-Stewartish, it doesn’t work without the labels because it is about tasting the different varieties and which you like best. We used to just spoon the caramel onto our plates and dip our apples in it, but then I found these small (1/8 cup) bowls on clearance and they work much better. It’s easier to get every last bit.